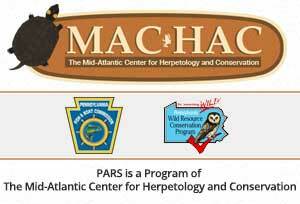 PARS volunteers are encouraged to decontaminate their field equipment before and after entering sensitive habitats such as wetlands or areas that may harbor snake dens. There are some nasty pathogens around which can have devastating effects of our herpetofauna. Good decontamination practices will help prevent the spread of these diseases*. 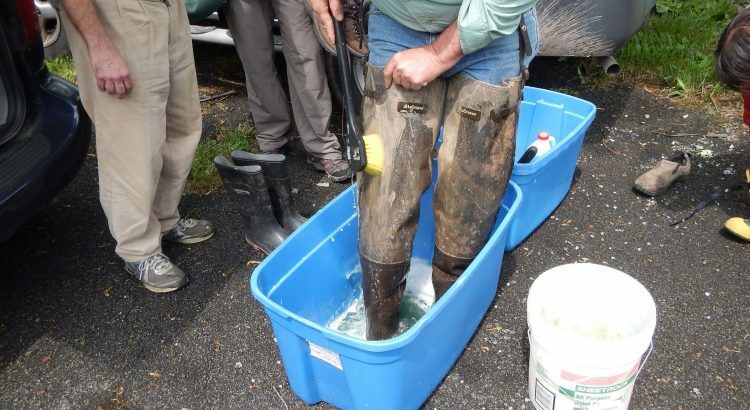 All equipment which comes in contact with water or the ground should be treated (boot soles, hip-waders, nets, snake hooks, walking sticks, etc.). We are currently recommending scrubbing down with a 2% chlorohexadine solution. A second choice would be a 2% bleach solution*, although this is not as effective on certain pathogens, and bleach can deteriorate equipment. You cannot be overly-cautious! Decontaminate immediately before and after each survey. Equipment should be soaked, or otherwise in contact with the solution for at least ten minutes (1-2 minutes is adequate when using chlorohexadine). Dirty equipment should be thoroughly scrubbed with solution. Make sure all surfaces come in contact with the solution. After treatment, rinse with clean water. Always remove boots and waders, etc. before treating to avoid skin contact. Avoid using felt-soled waders and boots; felt has a much greater potential for retaining pathogens. *Always carefully follow instructions on the label of any decontamination product.